French rabbinical scholar and Biblical commentator; flourished in the thirteenth century. His authority was invoked by Mordecai (Giṭ. iv., No. 384; Ber. vi. ), and by R. Perez in his glosses on the "Semaḳ" (No. 293). He is mentioned as a Biblical commentator in "Da'at Zeḳenim" (p. 33b), and as an author of responsa in "Sha'are Dura" (12a, 25b, 46a). He is also mentioned in "Kol Bo" (No. 114) as having corresponded with R. Nathanael. 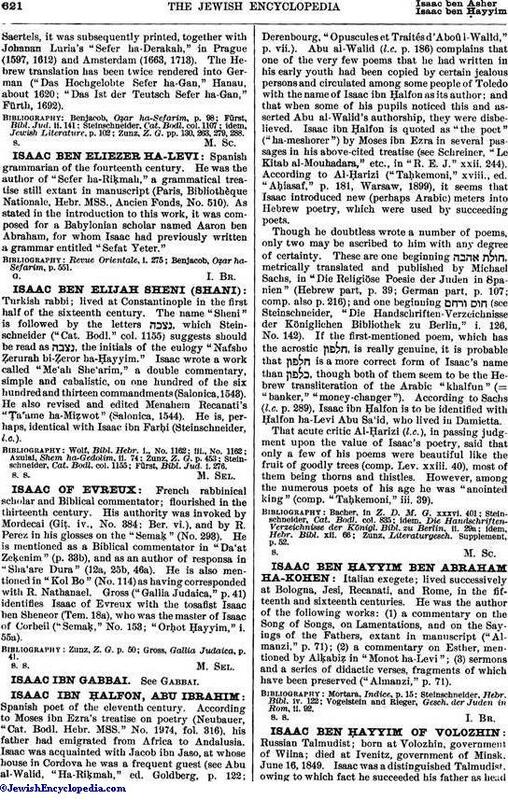 Gross ("Gallia Judaica," p. 41) identifies Isaac of Evreux with the tosafist Isaac ben Sheneor (Tem. 18a), who was the master of Isaac of Corbeil ("Semaḳ," No. 153; "Orḥot Ḥayyim," i. 55a). Gross, Gallia Judaica, p. 41.